A 600-hp one-of-a-kind luxury performance machine. BMW is no stranger to doing special editions. But when it comes to Alpina, the also German-based company that develops high-performance versions of BMWs, special editions are a little less common. One-offs even more so. So we were pleasantly surprised to see this: the BMW Alpina B6 xDrive Gran Coupe CCA Edition. And yes, it’s a one-of-a-kind. Developed in collaboration between BMW, BMW Car Club of America and Alpina, this bespoke B6 Gran Coupe has received a number of upgrades, both aesthetically and mechanically. Power comes from the familiar 4.4-liter twin-turbo V8 with 600 hp and 590 lb-ft of torque. Zero to 60 mph happens in just 3.6 seconds and it has a top speed of 198 mph. To give things an extra growl, the car received an Akrapovic titanium exhaust system, engineered as a one-piece system stretching over a length of about 12 feet from the downpipes to the rear tailpipes. It’s made entirely of titanium, which helps reduce weight more than 15 pounds. The two twin tailpipes are finished with a carbon fiber trim. The exterior is finished in Alpina Blue Metallic. But it’s the interior where the real craftsmanship was done. Step inside and you’ll find Merino Opal White Full Merino leather, piano black trim featuring a BMW CCA Edition silver inscription on the center console. There’s also a hand-finished Alpina Lavalina steering wheel with bespoke stitching that, along with the floor and trunk mats, matches the Merino Opal leather upholstery. The headrests, of course, also have an embossed Alpina logo. Lastly, there’s a BMW CCA Edition 01/01 inscription plaque on the engine bay, boasting the signatures of the father-son duo behind the Alpina family business. 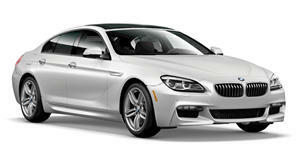 No pricing was given because it appears this one-off Alpina B6 Gran Coupe will be rewarded to one lucky raffle winner.